What can a blue belt karateka learn from a black belt workout? Read this blog post by one of our newer students who agreed to be uke for one of our club members during our black belt test! Twelve hours in the Ninja Bus. 38 hours in Bryan, TX. Twelve more hours in the bus. 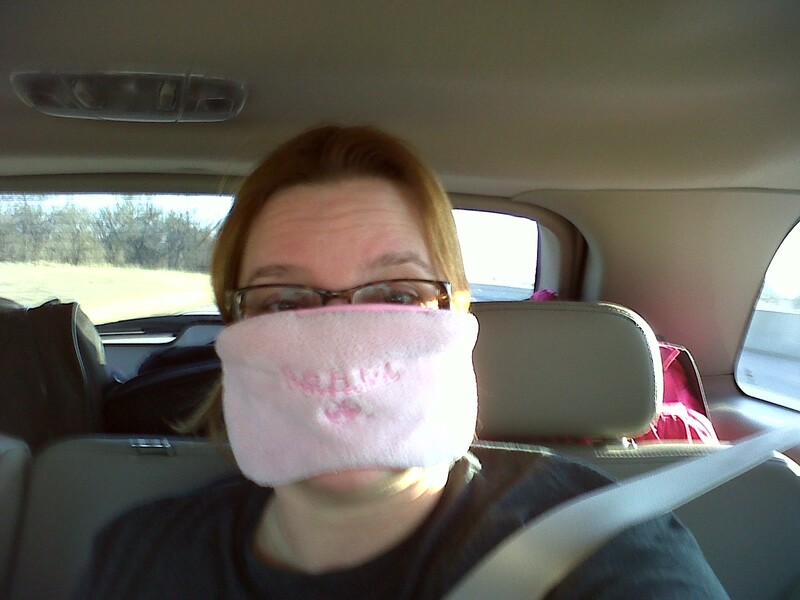 Desperate measures to avoid the beef jerky stink. We looked for armadillos on the roadside, but the only ones we saw were fuzzy replicas at the truck stop. I watched for Walker, Texas Ranger to ride by on his horse but he didn’t show. Even better, I got a lesson in knife defense from a real-life county investigator. 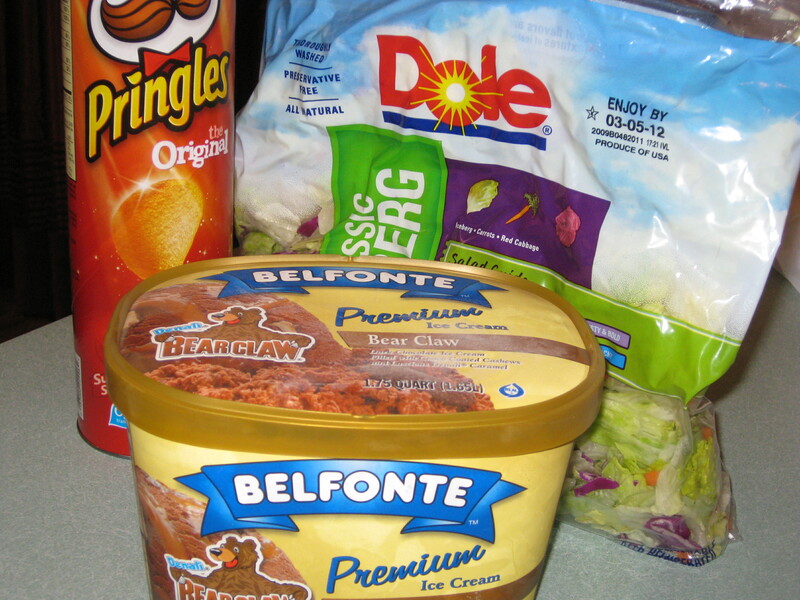 I discovered greens, ate smoked bologna and mysterious boudin balls for the first time. I had alligator, not for the first time. In case you’re wondering, it tastes like chicken. I passed on the pork skins, but devoured brisket and strawberry banana cake. I reconnected with old friends and made new ones. Including a volunteer at the military museum who wouldn’t stop following me. Working Hanshi Baker’s Finger Lock Flow. I worked a finger lock flow, practiced increasing my reach, reviewed bunkai, and tried new things. I saw a well-respected martial artist honored by many who love him. I learned on the mat alongside the masters of our art. I felt privileged. I was privileged. It was a whirlwind of a weekend, and I’d do it again in a heartbeat! All Aboard the Ninja Bus! I’m getting excited! Tomorrow morning we’re loading up Renshi’s Ninja Bus and heading to Texas for the 3rd Annual ABBA Black Belt Retreat. I’ve never been to this retreat, so I’m really looking forward to it. Master Instructors for the weekend include: Hanshi Dan Kennedy (the head of my system, the USKK), Hanshi Roger Greene, Hanshi Ken Baker, Hanshi Ron Rogers, and Hanshi Ray Montoya. Some of these 9th & 10th degree black belts will be sitting on the board at my black belt test next month, so it’ll be good for me to have more exposure to them. Hanshi Montoya is sponsoring the clinic at his dojo, Montoya’s Shorin Kempo Karate. Not only am I excited about the instructors and clinic sessions, but the trip should be a blast! What’s so fun about spending 12 hours — each way — trapped in a vehicle with Renshi and Captain Random? Once the energy drinks are guzzled, you never know what the topic of conversation will be! Captain Random and I know that if we can get Renshi to laugh really, REALLY hard, he’ll laugh so hard he cries, and then he’ll have to pull the car over until he can see again. How did we figure that out? We got him laughing so hard in Colorado Springs a couple of years ago that he had to pull over on the mountain road on the way to the Royal Gorge. Since there isn’t a shoulder to pull off on, that meant when we pulled to the side and stopped, all traffic following us had to stop, too. And that was only one of the times he had to stop driving that weekend! I’m expecting a great weekend of both laughter and tears, along with some great instruction. Twice a week I work out with my club at the office, and once a week I try to go to the hombu for a Brown/Black Belt Class. Brown/Black Belt Class is an advanced class typically taught by Hanshi, and sometimes by a senior black belt. We get to work things that challenge my thinking and my skills. 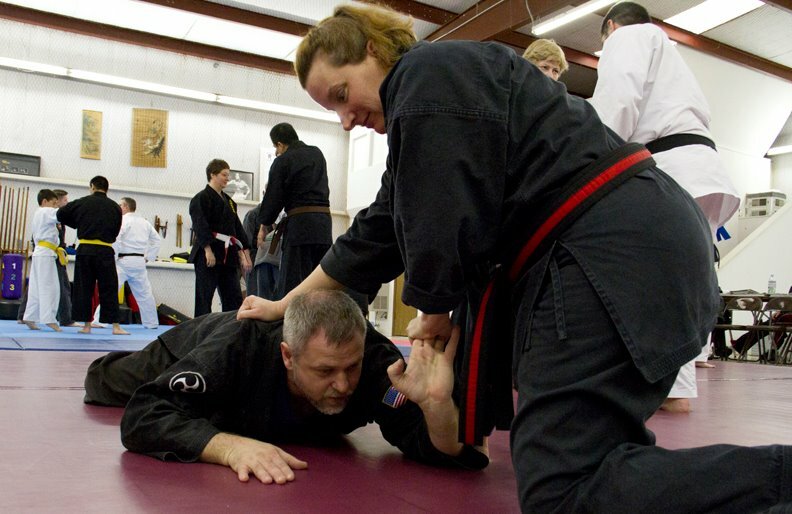 In addition to learning kata or self-defense techniques, the instructor may go a bit deeper into alternate ways to do things or the bunkai behind the kata. First Sensei had us work kick sets, which are my favorite! I love to kick, so these combinations are particularly fun for me. The object of the drill is to practice our distance, to be able to put a kick on target with full extension of the leg. For some reason we’re not supposed to kick through the uke and break their ribs with the extension, we’re just supposed to make contact. Actually, that’s a good thing, since half the time I’m the uke and I’d like to keep my ribs intact! I’m not the best at spinning sidekicks, so that was something I concentrated on. I tend to forget to keep my knees bent, and I don’t always remember to turn my head before I spin, so I easily get off balance. Sometimes I look like a dizzy girl instead of a spinning top! Sensei tweaked the placement of my front foot after the kicks. I was stepping too far into the uke, and leaving myself in a bad position. Now I know to go toe-to-toe with the attacker, where there is less chance of getting my feet swept from under me. After kick sets, it was Hanshi’s turn to tweak our techniques, and we worked Set 7, Street Techniques. The entry to this is a parry block with one hand that’s followed by a shuto and a wrist grab with the other hand. I always have trouble with this set because, well, my wrist has bones in it. It doesn’t turn in all directions! It would be easier if I slid a bit to the side and rotated my hips, but I usually forget to do that and I’m left trying to grab my uke’s wrist in an awkward manner. These are particularly hard for me if I’m working with a big attacker. Hanshi showed us a better way. Instead of grabbing the wrist at chest or shoulder height, he showed us to use the shuto to guide the attacker’s hand downward, where it is easier and more natural to grip their wrist. Well what do you know – I could make it work that way! I learned something from both of the sets we worked and I’m looking forward to working them again. I think the Street Techniques will continue to challenge me, but I’ll keep practicing and eventually they’ll flow more smoothly!